Did you see her? Did you get a look at Frances Teague in the passing parade? You had to look fast, but she was there, one of the stunning beauties of the silent screen. Frances Teague, Photoplay magazine, 1925. I came across her portrait about a month ago while looking through a 1925 Photoplay magazine. I almost passed it by, but her eyes caught my eye. The mysterious and mesmerizing Frances Teague. Who was she anyway? She did she come from? What was the extent of her film career in Hollywood? What became of Frances Teague? She came from Oakland, California, born April 12, 1905, to Walter E. and Margaret Teague. The name Teague was well known in the Bay area. Frances’s great-grandfather furnished the teams for grading the old Central Pacific Railroad, the final link in the transcontinental railway. Her father was the manager of the Operating Department of the Southern Pacific Company. Early publicity suggests that Frances had dramatics and dancing as her childhood ambitions. Her daughter, Patricia (Pat) Hillsinger, speaking in an interview with this author in August 2012, said she was not aware of her mother’s interest in the arts. Nevertheless, she stood out in Oakland as a beauty among beauties. The Oakland Tribune followed her development over the years. After she entered films, the newspaper featured her on the front page, showing her progression through the years. According to press reports, Frances spent six years studying aesthetic dancing. She specialized in dramatics at Miss Hamlin’s exclusive girl’s school in San Francisco. 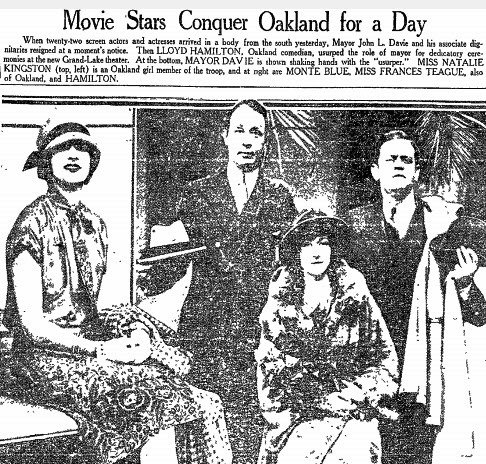 Newspaper accounts of Frances’s entry into motion pictures are contradictory. One account involves director Eric von Stroheim. While on location in San Francisco with Greed, Von Stroheim secured the cooperation of Southern Pacific officals for some location settings. When the director paid a visit to Walter Teague’s office at Southern Pacific, he took one look at Frances’s photograph on her father’s desk and asked to make some screen tests. He promised her a part an upcoming production, but the offer never materialized. The other account has Frances being discovered shortly after her arrival in Hollywood. When she graduated from Miss Hamlin’s, Frances and her parents moved to Los Angeles. Her early publicity suggests the family moved to allow Frances to pursue her acting ambitions. Frances’s daughter, however, says the reason they ventured south was at the request of a railroad official in Los Angeles who asked Walter Teague to start a produce terminal in Los Angeles. In addition, Frances’s older brother, Earle, after attending agriculture school, was working in the farming industry in the Los Angeles area. 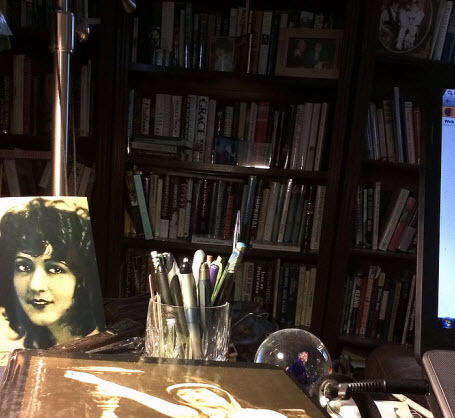 The Teagues settled into a house in fashionable Whitley Heights next door to Rudolph Valentino. Frances’s daughter remembers her mother speaking fondly of the Latin heartthrob over the years. “She thought he was a very nice man,” Pat Hillsinger said. Plus, they shared a common bond: they were both dog lovers. “My mother told me that tour buses would come up to Whitley Heights from Hollywood and stop in front of Valentino’s house,” Pat said. Fans clamored for a glimpse of Rudy. A man, dressed in workman’s clothes, frequently worked on a car out front and would wave to the fans as the bus passed. The fans thought they were waving to one of Rudy’s hired hands, never realizing the man covered in motor oil was Valentino himself. 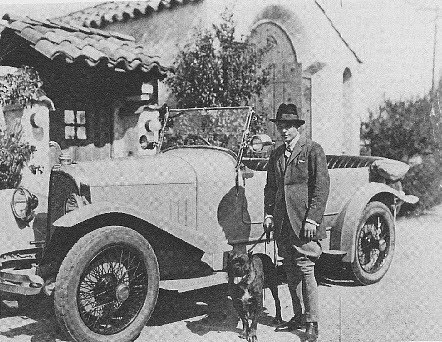 Rudolph Valentino, with his car and canine friend, in front of his Whitley Heights home. After a short time in Hollywood, Frances was signed to contract at Fox Studios. Press reports at the time stated that John Ford had hired her for the feminine lead in The Iron Horse (1924), which centers on the building of the transcontinental railroad. 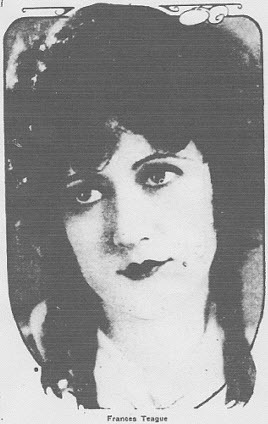 Madge Bellamy, however, played the lead opposite George O’Brien. Frances appeared as Polka Dot, the dance hall girl. The publicity machine pitched in to promote Frances’s career. The story was that Lloyd’s of London had insured her curls into the six figures. Frances then had small parts in John Ford’s Hearts of Oak (1924) and Her Husband’s Secret (1925). 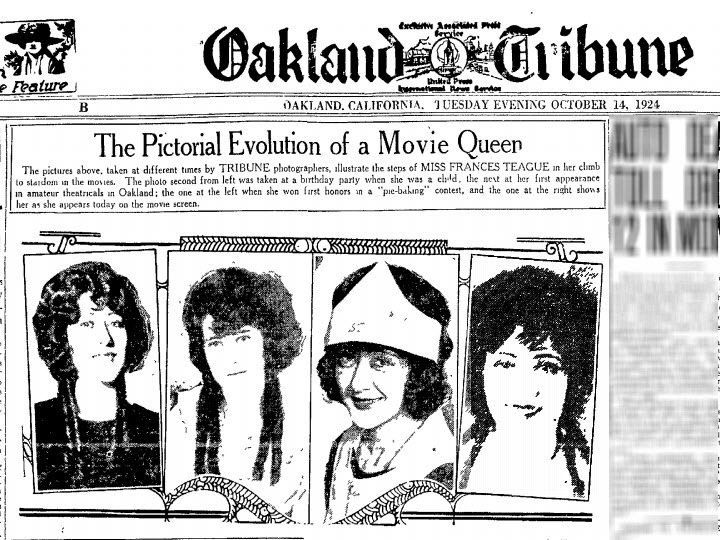 Oakland was proud of its hometown girl and all the stars of filmdom who hailed from their city. Frances, along with Natalie Kingston, Lloyd Hamilton, and Monte Blue returned to their hometown in March 1926 and were honored by Mayor John L. Davis. Frances, sitting between Monte Blue and Lloyd Hamilton, was honored by Oakland, her hometown. 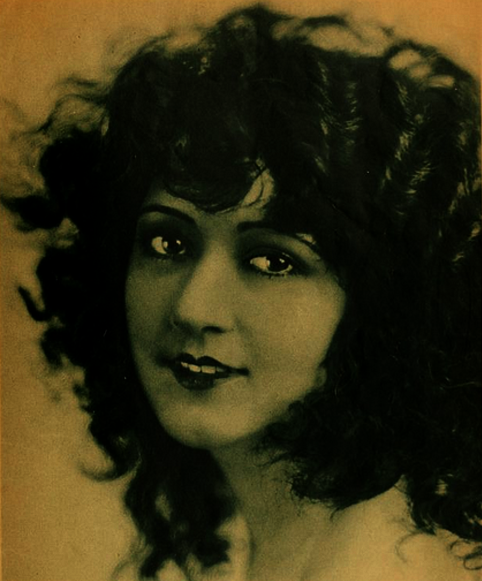 In Wild Justice (1925), Frances plays Polly Ann Hadley. Polly Ann’s uncle is murdered by a brutal thug. 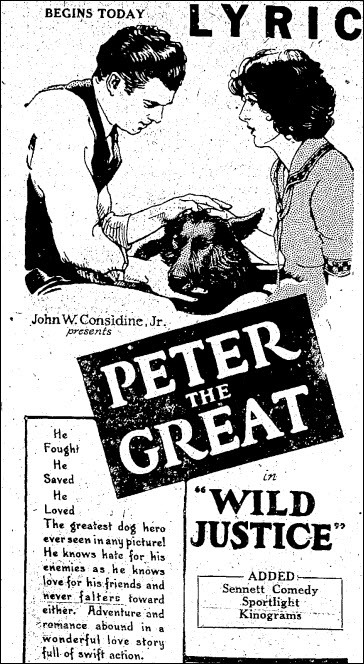 The ruffian takes over the uncle’s cabin and his dog, Arno (Peter the Great). When Polly Ann comes to visit, the bandit attempts to force himself on her, but Arno comes to her aid until the kindly doctor (George Sherwood) arrives on the scene and rescues her. Frances and Jack Daugherty thrilled audiences in the 10-chapter serial, The Trail of the Tiger, for Universal in 1927 and ’28. Then, Frances Teague vanished from the screen. Her trail ended with The Trail of the Tiger. What became of Frances Teague? Her daughter, Pat Hillsinger, filled in the details. It’s not exactly clear why Frances left films. She certainly didn’t leave Hollywood. 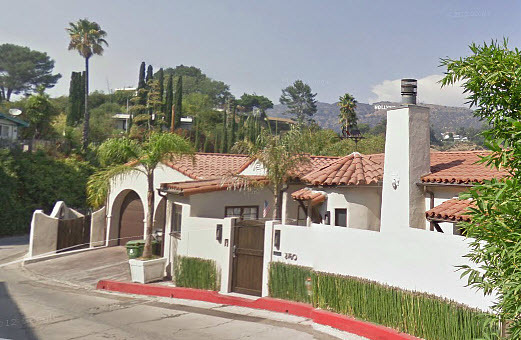 After they settled in the city, the Teagues built a house in the Hollywood Hills at 2760 Hollyridge Drive. Frances Teague’s home in the Hollywood Hills. In April 1931, Frances married Charles L. Tilley, the general manager of the Outer Harbor Dock and Wharf Company in San Pedro. Their daughter, Patricia Ann, was born in January 1932. A son, Walter, came along in 1935. Pat said her mother never talked about being an actress, so she couldn’t say exactly why her career came to an abrupt end in the late 1920s. In fact, no one in Pat’s family ever talked about Frances having been an actress. When the Japanese bombed Pearl Harbor in 1941, Charles Tilley, because of his waterfront business, was asked to move down to San Pedro. In case of an invasion of the harbor, he could be on the scene in minutes. Over time, however, the couple built a home in nearby Palo Verdes and Frances fell in love with the area. The former actress was “extremely active” over the years, her daughter said. She started a Girl Scout troop, volunteered for the Red Cross, and supervised a group who made socks for men in the Army and Navy. She was active in the Assistance League of Long Beach for years. After the war, she devoted herself to a number of charities and remained socially active. Frances Teague retained her beauty throughout much of her life. In the late 1960s, Frances was stricken with cancer. She died on July 29, 1969, at age 64. Frances Teague was one of the many actresses who passed by quickly in the parade of Hollywood hopefuls. I’m grateful to Frances’s daughter for telling me the story of her mother’s life. After a month of digging around in the past, I am still intrigued by the portrait I found of Frances in an old Photoplay. I have it on my desk as I write these words. I think I’ll keep it around a little while longer.